Why Teaching history through picture books works. When I started writing the lessons that became the Orange Level curriculum, I thought that I could create lessons based on great picture books. I could have those lessons teach all the subjects! Social Studies, Science, History, Art, and Language Arts. Even Math. Along the way, I threw in lots of other random topics like music, foreign language, life skills and as much food as possible. The resulting lessons made homeschooling easy. One curriculum for everything a 5- to 6-year-old child needs to learn. Then I asked myself: could I do this for older kids? Could I use this method to teach history? Learning through picture books was working. Connecting science to social studies and history was resulting in deeper connections for my children. It was also making homeschooling less stressful for me. I didn’t have to follow a separate lesson plan for every subject. I didn’t have tons of materials or other books I needed to keep track of week-to-week. So I started writing a unit study for United States History. I quickly saw a gap in other programs. The history, diversity, and culture of the Indigenous People of North America and Hawai‘i were being neglected. They are where the story of America, Canada and Mexico start. So that was where I wanted to start, too. 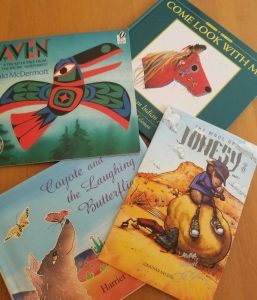 It turns out that there are some amazing children’s books about Native Americans. And all of them created great opportunities to teach children about earth science, biology, and astronomy. For example, a myth about Raven bringing the Sun to the Haida people of the Pacific Northwest lends itself not only to learning more about the geography of the Pacific coast, and the tribes there but also to learning about real ravens and the composition of our sun. I was once again able to make connections in language arts, foreign languages, and music. Hands-on actives for life skills, art, science, social studies, geography, and even some math. It all came pouring out, ready to be explored. 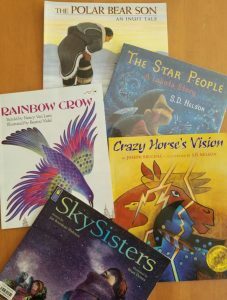 The diversity of picture books about Native Americans and other Indigenous People helped create lessons that tell a complex history. A complex history that reaches to the modern day. The lessons being with the Mound Builders, who lived in North America long before the arrival of the Europeans. Next, there are a series of myths and historical fiction books. These works bring to life the cultural diversity of the many groups of Indigenous people in North America. Following that, there is a set of biographies to teach parts of history that are often neglected. The unit ends with a set of stories about modern Native Americans, living and celebrating their culture and history today. This unit cannot possibly cover all the tribes and groups of indigenous people of North America. But it is a start. 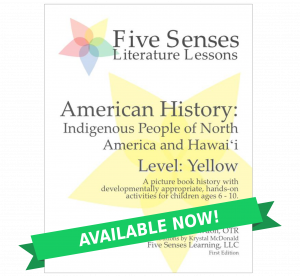 The Yellow Level is designed for children ages 6-10, who are ready to learn history and still enjoy picture books. The pictures themselves teach us about clothes, homes, and art making the picture books a valuable learning tool. The stories give us the foundation to expand into so many engaging topics. If you are teaching U.S. history to your child this year, I hope you will start with this program. If you would like to see a sample, you can download the first lesson in the program by clicking here. Want to learn more about our other programs? Each program has been carefully developed by an Occupational Therapist to support brain and body development in an age-appropriate way. 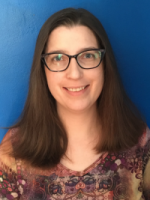 Laura Sowdon, OTR/L is an occupational therapist, writer, speaker, educator and creator of the Five Senses Literature Lessons homeschool curriculum. Laura has worked as an occupational therapist with children in public and private schools, as well as private practice. Laura has taught and managed homeschool co-ops as well as homeschooling her own three children. Laura is dedicated to the idea of educating children at a pace that aligns with brain and physical development milestones and respects neurodiversity in all its forms. Previous: Previous post: Happy Indigenous People’s Day! Next: Next post: It’s a Wonderful World!